The /proc/timer_stats interface allows one to check on timer usage in a Linux system and hence detect any misuse of timers that can cause excessive wake up events (and also waste power). /proc/timer_stats reports the process id (pid) of a task that initialised the timer, the name of the task, the name of the function that initialised the timer and the name of the timer callback function. To enable timer sampling, write "1\n" to /proc/timer_stats and to disable write "0\n". While this interface is simple to use, collecting multiple samples over a long period of time to monitor overall system behaviour takes a little more effort. To help with this, I've written a very simple tool called eventstat that calculates the rate of events per second and can dump the data in a .csv (comma separated values) format for importing into a spreadsheet such as LibreOffice for further analysis (such as graphing). .. this gathers samples every 10 seconds for 60 samples (which equates to 10 minutes). The -t option specifies an events/second threshold to discard events less than this threshold, for example: sudo cpustat -t 10 will show events running at 10Hz or higher. To dump the samples into a .csv file, use the -r option followed by the name of the .csv file. If you just want to collect just the samples into a .csv file and not see the statistics during the run, use also the -q option, e.g. 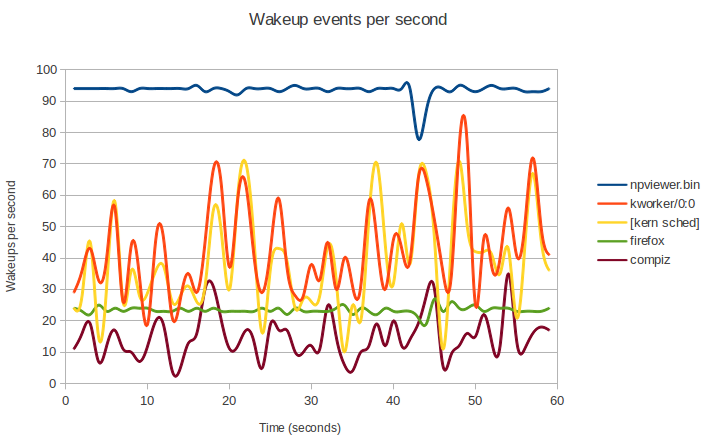 With eventstat you can quickly identify rouge processes that cause a high frequency of wake ups. 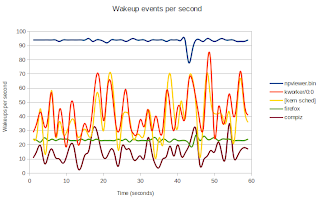 Arguably one can do this with tools such as PowerTop, but eventstat was written to allow one to collect the event statistics over a very long period of time and then help to analyse or graph the data in tools such as Libre Office spreadsheet. In an ideal world, application developers should check their code with tools like eventstat or PowerTop to ensure that the application is not misbehaving and causing excessive wake ups especially because abuse of timers could be happening in the supporting libraries that applications may be using.